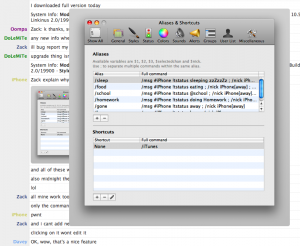 In July of last year I finally found a decent IRC client for OS X; Linkinus. Now, I know some of you will cry foul at that statement, after all there is Colloquy and the venerable X-Chat Aqua. I’m sorry, but they both sucked. Colloquy is quite stagnant, and has had the long-standing display bug (which is solved with /reload styles) forever. X-Chat Aqua on the other hand is great, except it’s obviously a ported applicaiton. Sorry, I’m a snob. So, here we are, almost a year later, and Linkinus 2.0 has just been released. I’m going to start out with the one bad point: I knew 2.0 was coming, and I knew it was a paid upgrade. So when I got the update notice, I clicked upgrade and it installed. Suddenly I was on a 15 day trial (and I only knew that because I went to the Registration dialog). It wasn’t a big deal for me, but not everybody will know. One of the most maddening bugs introduced in Linkinus 1.3 was it’s inability to remember if you closed a channel if it crashed. This meant I had an ever increasing number of channels and queries building up. Thankfully, one of the new features in the sidebar, is the ability to multiple select items and close them. In addition, the indicators in the sidebar are nicer and more informative. When you select multiple items, as in previous versions, it will split the chat between all the selected channels (and queries); however in 2.0 the display of these makes the current one much more obvious. In addition, switching between them (Using Cmd+Shift+Up/Down) uses a tasteful fade animation. 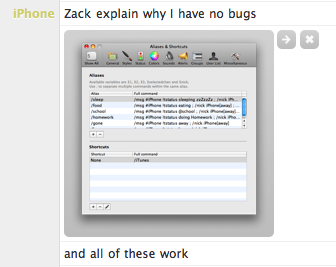 Lets face it, IRC is all about the chat. 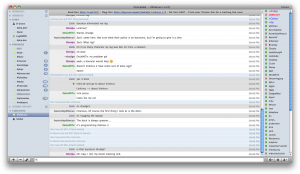 In Linkinus 2.0, the chat takes center stage. With the new visual style, it’s simple, understated and highly legible. One of the neatest features is the ability to hover over anyones nick and it will highlight all other on-screen lines by that user. The expansion is fast (though obviously depends on the service response), unfortunately, so is the mouseout. When the mouse is no longer hovering over the tiny url, it contracts again; this wouldn’t be a big deal except that as soon as someone says a line your mouse is no longer over the URL and you lose it. In a busy channel this makes it a pain. A small delay would be welcome. 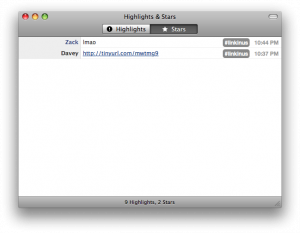 The only other feature I wanted to highlight in this review, is the “Stars” feature. 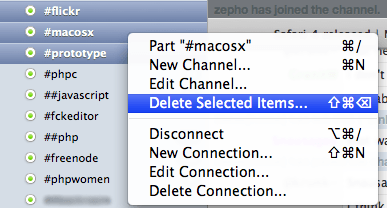 Essentially, this is Bookmarks for IRC. Allowing you save favorite quotes for posterity. I said that Linkinus 1.0 was worth paying for; I will say it again and more for 2.0. 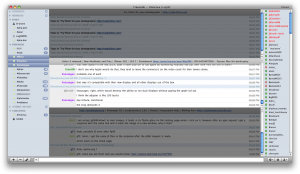 I’ve barely scratched the surface here, but Linkinus 2.0 is by far the best IRC client on any platform, for any price. Grab it now at the Conceited Software website for the paltry sum of €19.99. Note: For Linkinus 1.0 users, you can get an upgrade at half price.